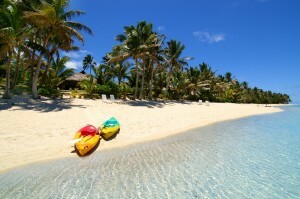 The Cook Islands will soon become a regular feature on the Remarkable Honeymoons website. We felt this post would be helpful to those seeking to get a feel for these lovely welcoming islands. A mix of coral atolls and volcanic islands – a good few of the nine Southern islands of the Cooks could be listed as “must see before I die”. An idyllic climate, stunning scenery, warm-hearted people and a desirable way of life where “hurry” has not been coined, make them irresistible. Bush clad volcanic peaks descend to glistening white sands and the inevitable palm-fringed blue lagoons: The Cook Islands is an Island Paradise. Rarotonga – the main island – and Aitutaki – breathtakingly beautiful – dominate the call of the conch. Atiu is over eight million years old and the third largest island in the Cooks. This island is an ecologist’s dream – and a magnet for the adventurer. A volcanic mass which has risen up out of the sea to be surrounded by a raised coral limestone reef named makatea. Its utter peace and harmony with nature certainly belay the island’s reputation of having harboured some of the fiercest warriors of the Southern Cooks , who constantly laid siege on their smaller neighbours in Mitiaro and Mauke. Sandy beaches on Atiu are scattered and secluded – but there are many to discover tucked like little secrets into the coast. Unspoiled and lush with dense rainforest and an unexpected central plateau – according to legend when the Polynesians landed on Atiu’s white crested shores, birds and insects were its only life. As one of the three southern group islands known as Nga-Pu-Toru, Atiu attracts the spirited explorer. With no nightclubs, virtually no township, around 400 people and a couple of cafes and precious little traffic – this is a true island escape. Life is pretty much the same as it was 25 years ago and offers a genuine insight into island living with its five small villages of Tengatangi, Areora, Ngatiarua, Mapumai and Teenui nestled in the centre. Gardens thrive on its rich soil and on certain days the soft aroma of organically grown coffee beans roasting wafts past from plantations that produce some of the best Arabica coffee in the Pacific. However today Atiu’s special appeal is the birdlife that will leave you breathless – birds flourish in the forest that thrives on the makatea, festooned as it is with rare giant ferns and abundant foliage. The rarest bird, the Kopeka, is a tiny swiftlet that navigates its flight in pitch black, sensing its journey using its bat-like sonar power. Found nowhere else in the world it lives inside limestone caves that line the island. Atiu is a trip for the intrepid. But for the ornithologists this island is a haven for viewing the exotic plumes of the Tavake, the White Capped Noddy, the Great Frigate and the Brown Bobby (no prizes for the naming rights on the last three!). The endangered Kakerori and the colourful Kura flit around historical sites. In fact some 11 native birds, the loudest of which is the blue kingfisher, with its calls through the still of the jungle, can be found here. And for the intrepid, a walk through the fantastic dense tropical jungle covering the makatea leads to Anatakitaki Cave where an astonishing three caverns harbour clear cool pools of water, stalagmites, stalactites and a high natural cathedral ceiling above. The caves, which riddle the makatea coastline, were often used as burial grounds and ancient artefacts can be found deep in the chambers. The Te Ana o Raka, with its amazing 15 chambers was the home of the Rakanui family. Nurau and Vai Akaruru are deep subterranean waters which cave divers dream about with their 50m depths. But if you think it’s only the lofty bird levels that hold appeal on this lush flatland – try a traditional rite that ends many a day for even the most diligent bird lover. Some of the Maoris found the missionary influence just a tad too much and when they were told “no drinking” they simply took to the bush and began their own ritual of the tumunu; a very convivial activity named after the brewing barrels which are carved out of the thickest part of the coconut palm. It involves passing round a half coconut filled with fermented fruit juice while sitting in a circle chatting. Opened and closed with a prayer, the ceremony has clear codes of conduct. But ultimately after a couple of swigs of this lethal potion, the chat becomes somewhat indecipherable. It certainly beats pub crawling. Meeting Atiu’s Birdman George is a must do when in the Cook Islands! Birdman George. George Mateariki is the birdman, he works with the Takitumu Conservation Area. George looks after the 30 Rarotongan Flycatchers (Kakerori) transferred to the island of Atiu in the years 2001 to 2003, as part of the recovery programme for an endangered bird that was reduced to 29 birds on Rarotonga in 1992. The ship rats attacks the birds on Rarotonga. There are no ship rats on Atiu and George is works part time to trap rats at the island entry points and monitor the Kakerori. Also because Atiu doesn’t have ship rats, 27 of the endangered Rimatara lorikeet were reintroduced to Atiu in 2007. They too are breeding successfully. Birdman George offers to show you these birds and all the other birds of Atiu in a tour that lasts 3 hours. George also does a splendid tour of the island incorporating ancient trails, the different types of plants and their uses, the birds he cares for and the beautiful beaches of Atiu followed by a picnic. On Sundays your can experience George’s “Reastaurant on the Beach” with local food from his family’s earth oven. We thank Cook Islands Tourism for their support.